Betfair Poker (www.Betfair.com) is an easy poker room to recommend because the “Betfair” name is associated with quality and professionalism in the European betting world. For years, Betfair has operated one of the most popular sports betting exchanges in the world. The Betfair gambling company expanded into the online poker industry in 2001 and has continued their tradition of excellence in that arena as well. Betfair is a great choice for non-USA players because they have been in business for almost a decade, are a licensed website in the UK, and offer soft poker games due to all of the sports bettors drifting over to the poker room. Plus, Betfair is currently running a special promotion for all BestPokerSites.org visitors - sign up through any of the links on this page, and automatically receive a massive sign up bonus, all the way up to a $2,500 deposit bonus. for (up to) a $2,500 Bonus! Betfair Poker does not accept players from the United States, but European and international players are welcome to join. With one of the biggest signup bonuses in the world, Betfair Poker appeals to poker players of all levels. And to top if all off, a large sports betting population results in games that are much softer than usual. The Betfair deposit bonus is unique in that it doesn’t matter how much you deposit. You can choose from five different deposit bonuses and each one has its own clearing requirements and maximum bonus amount. As you earn Player Points in the games, the bonus money is released to your account in increments. $2500 Bonus – Earn $500 for every 7000 Player Points earned in the first 60 days. $1000 Bonus – Earn $100 for every 1000 Player Points earned in the first 60 days. $500 Bonus – Earn $25 for every 225 Player Points earned in the first 60 days. $250 Bonus – Earn $10 for every 80 Player Points earned in the first 60 days. $50 Bonus – Earn $5 for every 40 Player Points earned in the first 90 days. These bonuses are not standard match bonuses. You don’t have to deposit a certain amount to receive any bonus. The only thing you have to do is earn Player Points. Of course, you will probably want to go with a smaller bonus if your first deposit is going to be small, and with the bigger bonus if your first deposit is going to be large. Player Points are earned in both cash games and tournaments. In cash games, 3.25 Player Points are earned for every dollar paid in rake. Tournament players earn points at a rate of 5 points per dollar paid in tournament fees. 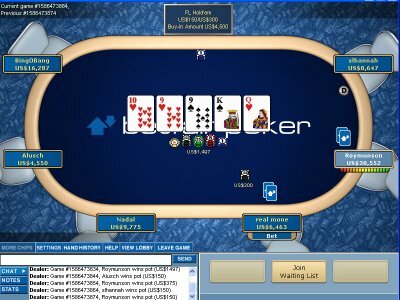 Betfair recently introduced a new poker client called “Betfair Poker 2.” This new poker software features vastly improved graphics, player avatars, advanced table sorting options and compatibility with both PCs and Macs. This new software setup supports up to 15 tables at a time and resizable windows. Tournaments are popular at Betfair Poker and the tournament selection grows larger every year. Their largest weekly poker tournament is held every Sunday and it offers a $200,000 guaranteed prize pool no matter how many players show up. In addition to that, Betfair offers a variety of other weekly tournaments that have prize pools that range from $10,000 to $100,000. A strong list of daily tournaments also gives players plenty of action during the week. A variety of regular tournaments are held every hour and several guaranteed tournaments are offered throughout the day. During the week, you’ll find guaranteed tournaments with prize pools that go up to $35,000. Betfair Poker can be considered a medium-sized poker site. There are definitely bigger poker sites out there, but Betfair Poker manages to hold its own. The cash games and tournaments are always full, but action can get sparse as you move up in stakes. One of the nice things about playing at Betfair Poker is that the competition is softer than average. Betfair’s main business is sports betting, so you get the occasional sports bettor who comes in to the poker room to blow some extra money. As a result, the games are softer than what you’ll find at poker-only sites. As a large, international betting site, Betfair accepts a wide variety of deposit options. The full list of deposit methods varies from one country to the next, but the list is comprehensive. Players can deposit at Betfair Poker with the following deposit options, plus many others depending on where you are located:via credit card, debit card, e-wallet, bank transfer and many other means. Most deposit methods support instant deposits and have very low minimums. When you’re ready to cash in your winnings, the same deposit methods can be used to get your money back quickly. The minimum withdrawal amount varies, but it usually ranges from no minimum to just $1.00. Customer support has always been a strong point of the Betfair business model. They have an extensive on-site FAQ plus multiple contact options that are staffed seven days a week. Players can e-mail, call and fax their questions to the support team and receive prompt answers around the clock. Ready to Play? Visit Betfair Poker to Get Started Now! Now that you know everything there is to know about Betfair.com's poker room, it's time to get started. Visit Betfair Poker through any of the links on this page to automatically receive our exclusive up to $2,500 sign up bonus.